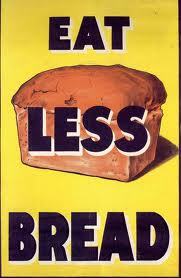 A ban on commercially baked white bread went into effect on April 6, 1942. 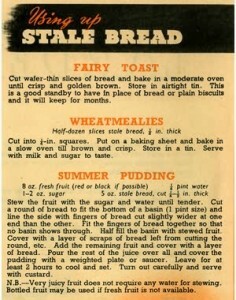 Dubbed Hitler’s Secret Weapon, the Ministry of Food created the National Loaf, a wholemeal flour bread. Before the war, white flour was the norm and when it became hard to come by, it was replaced by National Flour, with “wheatmeal” being the official name given it. National “wheatmeal flour” was unbleached flour extracted from hulled wheat grain (85%). The flour had the starchy endosperm, wheat germ, and bran, with the coarser bran being removed in the milling process. The flour was not a true “whole wheat,” but it left all the bran in it. The flour was gray in color which made it unappetizing to most. Some would sift the National Flour as much as possible to get out the softest part of the flour.